An exhibition showcasing the ancient history and heritage of Sumatra is on show at the National Museum in Jakarta, before going to the Netherlands and the Asian Civilisations Museum next year. It looks like something I’m definitely going to catch at the ACM! Jakarta â€™s National Museum began Monday to display more than 200 collections of ancient Sumatran heritages. The exhibition will last through Sept. 8. Ancient inscriptions, maps, manuscripts, statues, and even Chinese ceramics and sultanate regalia â€“ all originated from past kingdom lives of Sumatrans â€“ are available to be looked at. 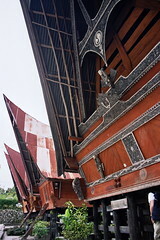 Currency of ancient Aceh kingdom Samudera Pasai, royal swords and keris, a Sultanate oar, traditional musical instruments and dresses, and miniatures of traditional Sumatran houses (such as the Rumah Gadang, Batak Karo houses and Nias houses) are also on display.